Tommy Hayes was born on March 31, 1917, in Portland, Oregon. He enlisted in the Aviation Cadet Program of the U.S. Army Air Corps on June 19, 1940, and was commissioned a 2d Lt and awarded his pilot wings at Kelly Field, Texas, on February 7, 1941. His first assignment was as a P-36 Hawk pilot with the 70th Pursuit Squadron of the 35th Pursuit Group at Hamilton Field, California, from February to December 1941, followed by service as a P-40 Warhawk pilot with the 17th Pursuit Squadron of the 24th Pursuit Group on Java in the Pacific Theater from December 1941 until he was shot down and wounded on February 19, 1942. 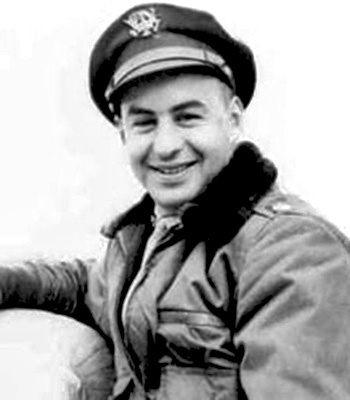 After recovering from his injuries, Lt Hayes transferred to the 35th Fighter Group in New Guinea, where he served as a P-39 Airacobra pilot from March 1942 until he returned to the United States in October 1942. During this time he was credited with the destruction of 2 enemy aircraft on the ground while strafing enemy airfields. His next assignment was as a flight instructor with the 328th Fighter Group at Hamilton Field from December 1942 to May 1943, followed by service as Commander of the 364th Fighter Squadron of the 357th Fighter Group at Santa Rosa and Oroville Army Airfields, California, and at Casper Army Airfield, Wyoming, from May to November 1943, and then deployed to England from December 1943 to March 1944, during which time he was credited with the destruction of 4 enemy aircraft in aerial combat, plus 1 probable. Lt Col Hayes served as Deputy Commander of the 357th Fighter Group in England from March to August 1944, and during this time he added another 4.5 enemy aircraft destroyed in the air, for a total of 8.5 destroyed in the air, 1 probable, and 2 destroyed on the ground during World War II. After returning to the United States he served as the Deputy Training and Operations Officer with the 3028th Army Air Force Base Unit at Luke Field, Arizona, from August 1944 to April 1945, and then as Director of Training and Operations, Air Inspector, Deputy Base Commander, and then Assistant Commandant for the 3028th Army Air Force Base Unit at Luke from April 1945 to November 1946. His next assignment was as Commanding Officer of the 3010 Army Air Force Base Unit at Williams Field, Arizona, from December 1946 to July 1947, followed by an Air Force Institute of Technology assignment to complete his bachelor's degree at the University of Oregon from August 1947 to September 1948. Col Hayes served as a Planning Officer with the Plans Division at Headquarters U.S. Air Force in the Pentagon from September 1948 to November 1951, and then attended NATO Defense College from December 1951 to May 1952. His next assignment was as an Air Member with the Combined Exercise Planning Department with NATO from June 1952 to June 1955, followed by service as Assistant Deputy for Operations with Headquarters Western Air Defense Force at Hamilton AFB, California, from July 1955 to September 1956. Col Hayes served as Assistant Deputy Chief of Staff for Operations with Headquarters Western Air Defense Force at Hamilton from October 1956 to September 1958, and then as Deputy Chief of Staff for Operations with Headquarters 28th Air Division at Hamilton from September 1958 to October 1959. His next assignment was as Chief of the Plans Division and Acting Director of Plans and Policies with Headquarters NORAD at Ent AFB, Colorado, from October 1959 to July 1962, followed by service as Commander of the Minot Air Defense Sector at Minot AFB, North Dakota, from July 1962 to July 1963. Brig Gen Hayes served as Vice Commander and then Commander of the 65th Air Division at Torrejon AB, Spain, from July 1963 to July 1964, and then as Commander of the 86th Air Division at Ramstein AB, West Germany, from July 1964 to January 1966. His final assignment was as Deputy Commander for Resources and Management with the Military Management and Terminal Service at the Pentagon from July 1966 until his retirement from the Air Force on February 1, 1970. Tommy Hayes died on July 24, 2008, and was buried at Arlington National Cemetery. For gallantry in action over Buna, New Guinea on August 25, 1942. Through a combination of heavy tropical rain and very limited visibility, Lieutenant Hayes skillfully piloted his P-400 type aircraft into position so that on the bombing run direct hits were scored and eight to ten enemy planes were destroyed on the ground, a gasoline dump went up in flames and a heavy calibre machine gun position was silenced. This very successful raid was accomplished against the Japanese at Buna. It was the second trip over the mountainous and jungle terrain to the target area that day for Lieutenant Hayes. On the first flight adverse weather prevented the formation from locating the enemy. Courage and determination were displayed by this officer in undertaking a second hazardous mission immediately after the first flight returned to the home base.